The NQ series incubator/ germinators will provide a uniform environment within ±0.5°C and an operating temperature range of 4°C to 40°C. Available as one or two door models of 30 and 64 ft3 capacity respectively, these units feature insulated construction with a durable baked enamel finish. NQ2 models have center opening doors and NQ1 models can be configured with either right or left hand door opening. 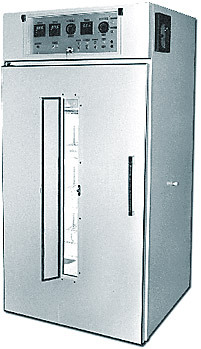 All doors are gasketed and lockable. Standard lighting is provided by fluorescent fixtures attached to chrome plated adjustable wire shelving. Higher light models also include fixed vertical lights in the corners. Depending on model, lighting intensity ranges from 15 µmoles to 131 µmoles at 15 cm below the lamps, with slightly less in the corners. Shelf lighting on both versions can be adjusted on 1" centers. Optional extras include viewing window (shown here), full digital humidity control, and various data recording and logging options. Exterior Dimensions (w/ std. casters) 36" x 34.5" 72" x 34.5"
Interior Dimensions 32" x 27.5" x 58" 68" x 27.5" x 58"
Access Door Size 36" x 62" 2 - 36" x 61"
Shipping Weight 435 lbs. 1240 lbs.